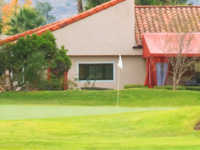 If you are looking for a place to work on your short game, Lindero Country Club offers affordable Agoura Hills golf deals. This quaint 9 hole executive course is located in Agoura Hills, Ca, approximately 40 miles north of Los Angeles right off of the Ventura Hwy (101). The course was designed by renowned golf course architect Ted Robinson Sr in 1967. The 9 hole executive course is a par 29, including three par 4s. The course covers 1,695 yards from the back tees. The Lindero Country Club curse is rated 29.7 with a slope of 96 on bent grass. Although this is a short course, you will still encounter rolling fairways, elevated greens, running creeks, narrow landing areas and a variety of bunkers. If you are looking for Agoura Hills tee times, you can reserve Lindero Country Club tee times online or by calling the course starter. Be sure to inquire about special promotions or discounts. Amenities include a nite-lite driving range, putting green, rental clubs, snack bar and a small pro shop. Dining facilities may be found within the country club facility. Golfers proclaim Lindero to be a terrific place to work on your iron play at a very affordable price. The course is very well maintained.